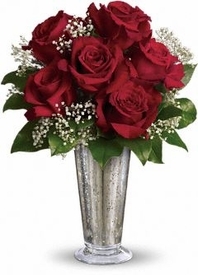 A vase of pink and red roses. Assorted flowers in a basket arrangement. All white arrangement in clear glass. A vase of Stargazer lilies. Mixed summery flowers in frosted vase. Anniversary Basket design of mixed flowers. Basket design of mixed flowers. Pink and lavender flowers in a handled basket. A posy vase of mixed stems. Bright flowers arranged in a basket.